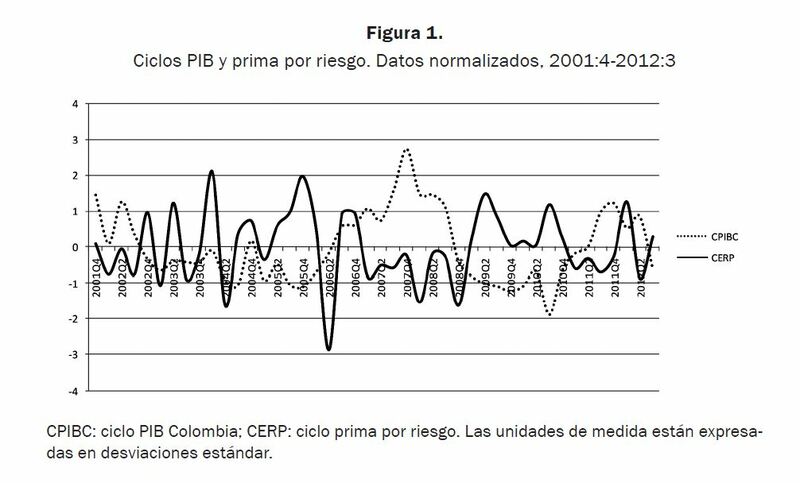 Through the Hodrick-Prescott methodology this paper presents a review about the relationship between the ex post risk premium of the stock market and business cycles observed in Colombia. Through quarterly information from the fourth quarter of 2001 to the third quarter of 2012, statistical evidence shows that the increase and decrease of ex post risk premium follow a countercyclical behavior in tune with existing research conducted about the United States and emerging economies, although with non-contemporary relationships with private consumption. In addition, it is found that in the last decade the Colombian risk premium follows a process of Auto Regressive Moving Average Models (ARMA), showing that there is no variation in at least two consecutive quarters and whose behavior is generated in part by external events at the domestic economic activity level experienced in near past periods. Fama, E. French, K. (1989). Business conditions and expected returns on stocks and bonds. Journal of Financial Economics, 25(1), 23-49. Recuperado de la base de datos Science Direct. Hess, G. e Iwata, S. (1997). Measuring and Comparing Business – Cycle Features. Journal of Business and Economic Statistics, 15(4), 432-444. Recuperado de la base de datos JSTOR. Hodrick, R. y Prescott, E. (1997). Postwar U.S. business cycles: an empirical investigation. Journal of Money, Credit and Banking, 29(1), 1-16. Recuperado de la base de datos JSTOR. Kuznets, S. (1930). Equilibrium Economics and Business - Cycle Theory. The Quarterly Journal of Economics, 44(1), 381-415. Recuperado de la base de datos JSTOR. Salomons, R. y Grootveld, H. (2003). The equity risk premium: emerging vs. developed markets. Emerging Markets Review, 4(2), 121-144. Recuperado de la base de datos ScienceDirect.